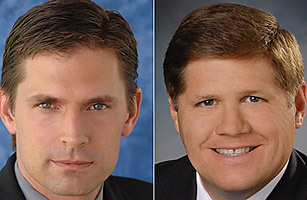 Martin Heinrich. left, and Darren White are seeking the U.S. House seat in the 1st Congressional District in New Mexico. President Bush's unpopularity is a burden for all Republicans running for Congress this year, but few bear it as heavily as Darren White, 45, the G.O.P. candidate in New Mexico's 1st District. So much so, in fact, that the area around Albuquerque could be poised to turn blue for the first time since the district was created in 1969. White, the Bernalillo County Sheriff, is locked in a tight race with Democrat Martin Heinrich, the former Albuquerque City Council President. The seat is up-for-grabs after five-term Republican incumbent Rep. Heather Wilson stepped down for an unsuccessful primary run in the state's U.S. Senate race. Heinrich, 36, began the race with considerably lower name recognition than the two-term sheriff White, a former police officer who once headed the state Department of Public Safety. But Heinrich has done his best to use White's prominence against the Republican by repeatedly highlighting his close ties to the President. White served as county director for the Bush-Cheney re-election campaign in 2004 and hosted Bush for a May fundraiser this year. A Heinrich TV ad calls White "George Bush's favorite sheriff,"while a DCCC ad echoes that he's "too much like Bush. "Heinrich has even called for White to repay taxpayers $5,000 in security costs incurred during Bush's fundraising visit. "It's a real yoke around his neck, and the Democrats are just pounding, pounding away on it," says Joe Monahan, a former journalist and veteran political observer in the state. As if that weren't enough, Heinrich has sought to link White to the Administration scandal over the politicized firings of U.S. Attorneys. White was named in a Justice Department report as one of several Republican officials who urged former U.S. Attorney David Iglesias to pursue allegations of voter fraud in the state  contacts Iglesias later described as improper political pressure. White has denied wrongdoing. Heinrich's strategy seems to be working. An Albuquerque Journal poll published Oct. 7 found Heinrich narrowly ahead of White, 43% to 41%, with independents favoring Heinrich by 16 points. Earlier polls have shown larger leads, including a six-point advantage in late September. Heinrich has also enjoyed a fundraising advantage. The campaign claims to have pulled in $2 million in contributions, compared to $1.5 million for Whitethough White has a larger stash of cash on hand. And while Heinrich has received significant advertising support from the Democratic Congressional Campaign Committee, White has just seen the National Republican Congressional Committee cancel $500,000 in TV advertising they planned for the race. The move is widely seen as a sign party leaders consider the district a probable lost cause. The 1st district, shaped like a schnauzer in the middle of the state, comprises Bernalillo County, which includes most of Albuquerque, as well as several suburbs and rural desert areas. Wilson hung on to her House seat in 2006 by just 861 votes out of 211,000 cast, one of the tightest races in the country. George W. Bush squeaked by Al Gore by just one percentage point in 2000, and topped Kerry by three points in 2004. New Mexico as a whole appears to be a good state for Democrats this year. Recent polls in the Land of Enchantment have Obama up five points or more against John McCain, aided by a strong field effort with three times as many offices as McCain. In the race for the state's open Senate seat, Democratic Rep. Tom Udall is far ahead of his Republican opponent. White, a veteran of the Army's famed 82nd Airborne Division who served as state director for Rudy Giuliani's presidential campaign this year, is a favorite among law enforcement groups. His platform emphasizes homeland security, low taxes and a tough line on illegal immigration. Heinrich, a former business owner, most recently left a governor-appointed job as New Mexico's Natural Resources Trustee. Energy independence and a swift withdrawal from Iraq are among his key issues. "I'll fight to end George Bush's disastrous war, so we can use the billions being spent there to help families here," he says in a TV ad. White concedes "mistakes have been made" in the war, but in a recent interview said "we cannot allow al-Qaeda to make Iraq a safe haven." He has tried to counter the Bush beating by accusing Heinrich of raising taxes in Albuquerque, and Republicans have accused Heinrich of failing to register as a lobbyist for consulting work he performed in the past. Heinrich's campaign has called the work "advocacy." Lately White has stepped up his offensive, with a striking TV ad featuring the mother of a slain sheriff's deputy calling Heinrich "despicable" for his attacks on White. Next Will an Obama Wave Usher in Iowa's First Congresswoman?